Coming from California, there are a lot of differences between the Golden State and the Gem State. Camping is one of them. Maybe it is because I never had the opportunity to go camping in undeveloped land, except deep in the Rockies, that undeveloped camping on public land is a foreign concept. I couldn’t wait to tell my parents that you could literally go into the forest and camp wherever you want. This guide is designed to help you know some of the Do’s and the Dont’s when it comes to camping on public land. Now the question is where to go. Check out Moody Meadows or near Harriman state park! This information was taken from the BLM & Forest Service Websites. We also contacted various Forest Service Rangers for further information. 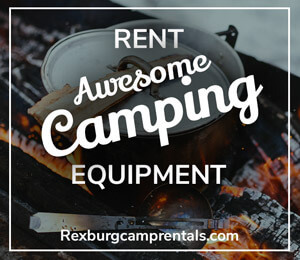 Dispersed camping is the experience of camping away from developed campgrounds and campers. It feels primitive, and you can gain greater peace and solitude. The term “Dispersed Camping” comes from camping anywhere outside of a designated campground. There are no services while dispersed camping. No tables, fire pits, trash removal, and facilities. However, some popular dispersed campgrounds may have toilets. You can generally camp nearby roads in national forests. The South Fork and Henry’s Fork of the Snake River corridors are subject to 5-day camp limit and require a fire pan and toilet system. Keep your vehicle maintained, mufflers secure, tires inspected and safety chains crossed and off the ground. One spark from dragging metal can cause a wildfire. Remember to extinguish your campfire every time you leave camp. Drown your fire with water, stir and feel it to ensure it is cold. Don’t drive or park on dry grass! Vehicle exhaust systems can reach up to 1,000 degrees and can easily start a wildfire in tall dry grasses. Possession and discharge of fireworks are prohibited on public lands. For wildfire and fire restriction information check www.idahofireinfo.com and follow @BLMidahofire on Twitter. Drive on established roads only. That’s pretty much it. Rules vary for each location. Get out there and enjoy the beautiful idaho country.